Pure's new Sensia isn't 'just' a radio, it's an 'internet connected digital audio system' doncha know? 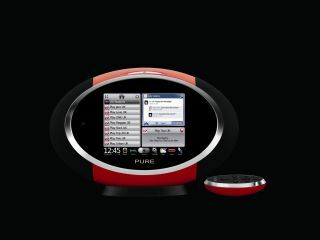 Pure has launched its new touchscreen 'connected radio' in London this week, with Pure's CEO hoping that the new Sensia 'internet connected digital audio system' will reinvigorate the radio experience for Brits, much in the same way that the "iPhone did for mobile." And continuing on the Apple-inspired theme, Pure's latest radio packs in a 5.7-inch glass capacitive touchscreen, via which listeners can quickly and easily search over 12,000 internet and broadcast radio stations. The Wi-Fi compatible DAB/DAB+ and FM radio device is the latest – and most impressive – manifestation of the UK company's 'connected radio' strategy or, to borrow Pure's own marketing tagline, it is "the radio for the Facebook generation". And that is no mere hollow marketing spiel, because another major part of Pure's longer term radio strategy was also unveiled alongside the new Sensia radio in London this week. An app store, which currently offers users the chance to access Twitter or Facebook or check the latest news and weather. And while the app store is fairly limited right now, the longer term plan is to open up the Sensia's SDK (software development kit) to third parties in 2010 to let developers and users organically create the apps that they want to use to improve their overall radio experience. "PURE made its name as the company behind the success of DAB. We've since created a market leading and multi award-winning, internet-connected product range with our Flow series," said Paul Smith, PURE's general manager. "Sensia is the next major innovation from PURE, which I am confident will bring radio to a whole new 'Facebook' generation while still inspiring our traditional customer base. Radio will never be the same again." TechRadar spoke with one Pure rep who informed us: "The machine is Linux-based and we can pretty much open it up to do whatever developers want it to do. We could, potentially, see a Spotify app for using that type of streaming service." The Pure rep also noted that the plans for integrating an MP3 store – enabling radio listeners to buy (and receive via email) MP3s of tunes they are listening to – as well as plans for further, more portable devices inspired by the Sensia, were all being considered for the future roadmap. "The Sensia is basically a showcase for our technology," he added. Overall, the Sensia is a massive improvement on Pure's current range of 'connected radios' - the Pure Evoke Flow and the Pure Avanti Flow – in that it takes all the best features of those devices, and makes the search and navigation of radio, podcasts or – streamed from your PC or Mac - your own content a considerably easier and more pleasurable experience. Users will also be able to add in the requisite iPod dock or, should you want to use the radio on the go, a rechargeable battery pack, which "should last at least twenty-four hours on a full charge" we are assured by Pure. The Sensia launches in the UK later in October in red, black, white or yellow with an RRP of £250, packing in Twitter and Weather apps, with Facebook, Picasa and a news app all set to arrive shortly after launch. Stay tuned (tuned, see!?) for our fully detailed hands on review of the new Pure Sensia shortly. In the meantime, for more, head over to www.touchmyradio.com.